Easter falls on April 20 this year, so it’s time to get ready for Easter in your church. Special music, fellowship opportunities, seasonal Christian education, and outreach to the community may be taking up a lot of attention in your church right now, but don’t forget the visual aspects of worship. Church pew decorations are one way to bring the vibrancy of spring and the glory of the Lord’s resurrection into your church and transform it from somber Good Friday. 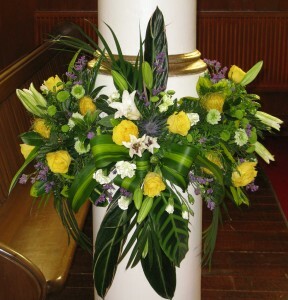 There are different ways you can decorate church pews but the easiest and most popular way is by using ribbon or rope and making a loop around a church pew end with the flower arrangement hung at the middle on the outside. The decoration at the top is a great idea for something simple and easy. 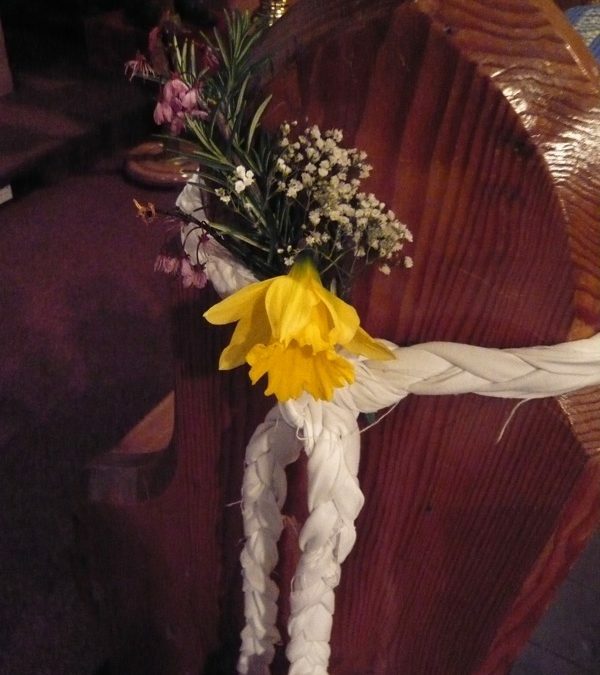 A braid of fabric tied around the pew is a great way to remind us about the linen burial cloth that Jesus left folded in the tomb after his resurrection. Some spring blooms, like these daffodils and baby’s breath, are a great way to bring life and freshness into your church for Easter in celebration. Not all churches have church pews that are easily decorated using a loop, especially more contemporary style church pew ends that don’t have a wide end that you can wrap something around. Instead, you can decorate support poles in your church as in this example. This display wraps around the entire pole with flowers so everyone can enjoy the display from all angles. It uses bright spring colors but also palm leaves formed into bows and crosses to remind us of the events leading up to Easter. This display takes more skill to build, but you can use this idea in your own church’s Easter decorations. Give some thought now to how you’d like your church to look on Easter morning so you can start ordering supplies and prepare as much in advance as possible.